Just like earlier spoofs that claimed that iOS 7 would end up making your iPhone waterproof, users from 4Chan’s message boards are back this time with a new one. This time the consequences of attempting to carry out their instructions can be potentially hazardous apart from making you buy a new smartphone. 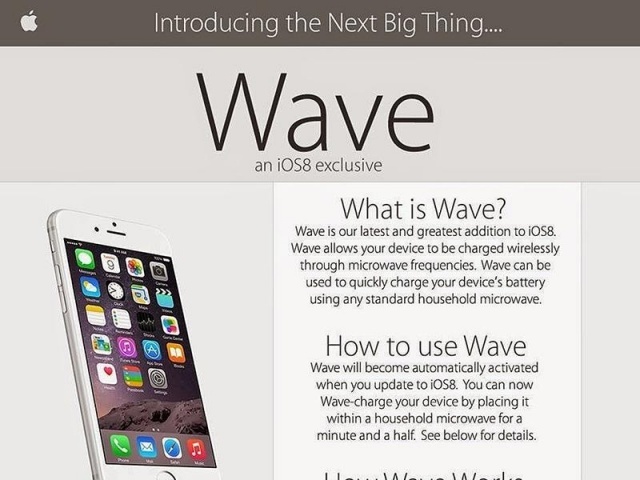 The idea behind this time’s prank is to get the unsuspecting iPhone 6 user to put their device in a microwave. To charge it. This will work allegedly through microwaves being able to charge the device. As amazing as it sounds, mobile battery technology is yet to compensate for low battery timings, let alone wireless microwave charging. So don’t put your device into a microwave for any reason whatsoever. According to the pranksters, Wave will activate automatically when you upgrade to iOS 8. Your iOS device will then be charged in a miraculous one and a half minute. The iOS advertisement has been making rounds so far on all social media sites so far. Whether anyone has fallen for the prank and actually fried their device is yet unknown. So spread the word as far as you can. To save existing and new Apple users from watching their device go up in flames and also potentially loose a perfectly good microwave oven in the process. “iOS 8 contains new drivers that interface with your device’s radio-baseband allowing it to synchronize with microwave frequencies and use them to recharge your battery.” explains the add. It also then warns you to not leave your device in the microwave for more than 300 seconds. Though why you should be placing it in a microwave in the first place is still unknown to us.